Alongside the waterfall there used to be three watermills. One is now being used as a weekend house, while the other two are in ruins. 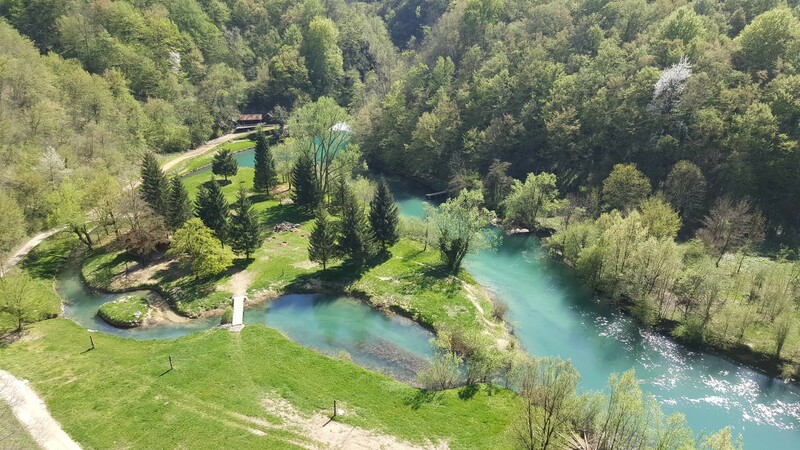 A few years ago, a company called Kelemen Energija decided to rebuild one and turn it into a small hydropower plant called Dabrova Dolina 1. Although it was in a protected area, the plan didn’t sound particularly problematic considering it was supposed to use the reconstructed millstream and mill building. In 2016 construction began, and so did new problems. The old mill was not renovated at all, but instead a completely new building was built. At the same time, the old mill remained unused, and the new channel took much more water than the old mill channel did. Oddly, the concessionaire did in fact construct another smaller water channel as well, which more closely resembles a millstream. However this does not serve any purpose in relation to the hydropower plant, but merely serves to divert even more water away from the tufa barrier. The creation of its intake also clearly damaged the tufa - as can be seen below. The minutes of the county inspectorate’s site visit, meanwhile, say that the visit was carried out on 23 November, not 22 November. This might be a typo, but they also say - in contrast to the national inspectorate’s report - that the sensor for monitoring water level has been installed already.